Welcome to the family of Carrom players. You will know about the different aspects of the gameof Carrom. Carrom is a very interesting indoor game, originated from pool billiard about 150 years ago in Indian sub-continent. Carrom is played by millions of people in Asia, especially in India, Pakistan, Sri Lanka, Bangladesh, Maldives, Nepal, Malaysia, Singapore, Afghanistan, United Arab Emirate, Japan and Korea. There are national federations in most of these countries. Large number of Carrom tournaments and other activities are organised in these countries. The Asian Carrom Confederation coordinates the activities of the national federations. Carrom is played in many countries of Europe such as Austria, Belgium, France, Germany, Greece, Holland, Italy, Poland, Portugal, Spain, Switzerland, United Kingdom. They organise Carrom tournaments, Carrom demonstrations and other promotional activities. The US Carrom Association coordinates their activities and allots National Chapionship tournaments in rotation. Carrom has attracted many people in this continent. 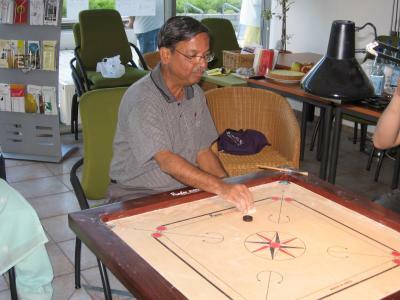 Carrom activities are organised under the auspices of the Carrom Federation of Australia.